The use of GPS has completely changed the way we fish. I have a box or two full of hydro, topo and fishing maps that I had collected over the years that I haven’t looked at in a long time, simply because most maps are now available on my Lowrance depth finder. But what about those times when you’re not in your boat? Say you’re canoeing in the back country, or you’re at a friends cottage, or at an outpost fishing camp – what to use then? This is where a smart phone or tablet based app like the Navionics Boating App can really be handy. I’ve been using this app for about two years now and I can’t believe how much of an indispensable tool it has become for me. We used it extensively for navigation while house-boating last summer and found it indispensable on our fishing trip to Island 10 Retreat on Lady Evelyn Lake. The lake charts and GPS allowed us to find spots that we would have never found using the paper maps provided to us. The speedometer was also perfect for dialing in trolling speeds. What I’ve really found handy is that you can browse around the maps of the lake you’re on while sitting around your cabin or camp fire. This evening pre-fishing really helps save time on the water. 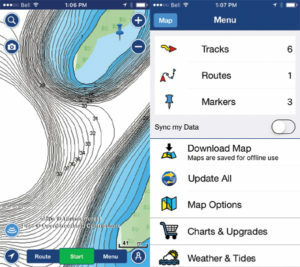 You can also do this for free on your computer using the Navionics Webapp. 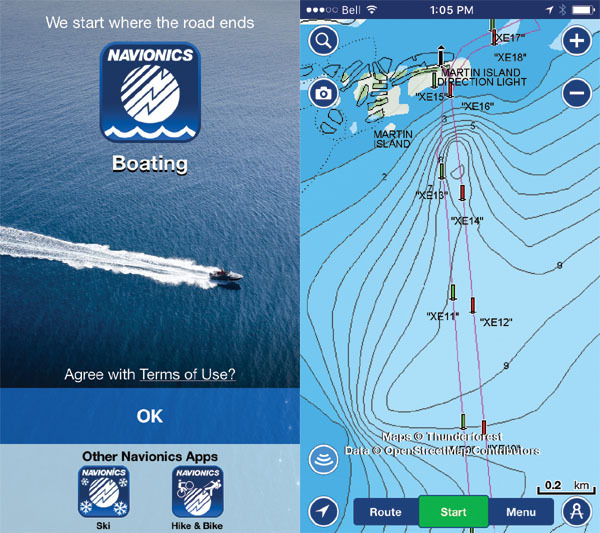 The maps are extremely detailed, everything you’d expect from Navionics. Like any GPS app, it tends to put a pretty big draw on your phone’s battery so if you have a method to charge your phone while out on the water bring it along. GPS accuracy is of course not as good as your dedicated electronics but can generally get you close enough for most fishing applications. If you are going to areas without cell phone service simple download the maps for that area prior to getting there (just zoom in to the area of interest and wait for the maps to load), the GPS and maps will continue to work without cell service. In fact, turn off you cellular data service in these areas to help conserve battery power. There are a variety of routing and other features on this app including tracks and markers, plus other options I’ve yet to explore. Check out this app, definitely on my recommended list.